Today was another hard day, for many in Liberia. Malcolm Harris, Provision of Hope Administrator, emailed me saying that another 12 died in a nearby village. The whole nation is in a state of emergency. Every day more and more people are dying. Today the World Health Organization announced there have been 3,500 cases of Ebola with more than 1,900 deaths since this outbreak started in Guinea in March. Forty per cent of the deaths have occurred in three weeks leading up to September 3, the WHO says. Right now this virus is spiraling OUT OF CONTROL. PLEASE PRAY FOR A MIRACLE! 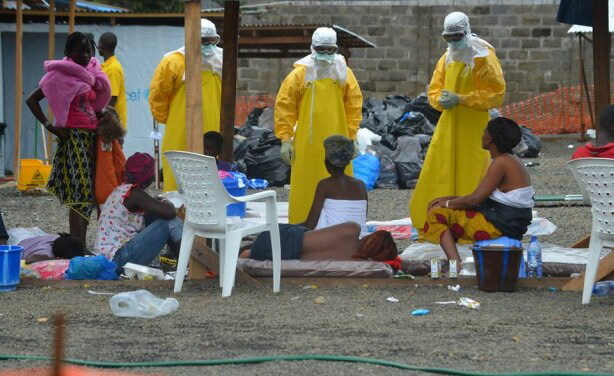 Of the 5 West African countries infected with this virus, Liberia has been hit the hardest. Last week 500 more cases were recorded. It is worse now than ever before in history! The borders are closed, areas are quarantined, flights are banned in and out of Liberia, various hospitals and clinics have closed and food has majorly increased in price! Many people are finding it extremely difficult with no income. Everyone fears a food scarcity. The whole economy is experiencing a major set back. So many are coming to Provision of Hope for help. We are asking everyone to consider what you could GIVE towards this state of emergency? CDC Director Dr. Tom Frieden (in the middle), dressed in Personal Protective Equipment (PPE), talks to patients confirmed to have Ebola at a treatment center operated by Medecins sans Frontieres at ELWA Hospital in Monrovia. This outbreak has been extremely hard on Liberia’s Health Care System, which was weak to begin with. The World Health Organization reported that 240 Health Care Workers contracted the virus killing 120 of them. WHO announced that there could potentially be 20,000 cases before the virus is under control. Hope for the Nations and Provision of Hope are doing all we can to bring relief and help to as many communities as possible. Hope for the Nations has already given out over 35,000 lbs of rice in Ganta and area. They have set up many sanitizing stations. It will take many NGO’s and humanitarian/social welfare organizations to help in this disaster! We need the international community along with governments of developed countries to assist. Lets ALL do what we can to help. Liberia is building five new Ebola treatment centres each with a capacity for 100 beds, government and health officials said on Saturday. An Ebola vaccine being developed by the National Institutes of Health and Drugmaker Glaxo Smith Kline, is going to be tested in healthy humans this week at the NIH in Bethesda, Md. Pray that it works! !